When you dabble in knitwear design and put out patterns, you are bound to put out pictures of your work. So far I have always done photography myself and it is really a learning curve for this amateur photographer. Today I want to give you a behind the scenes look. All of the models I have worked with in the past, are my friends. Most of the time, I will entice them with knitted goods, and they always are willing to work with me. Lucky me! For a photo shoot, somebody has to take care of hair and make-up. And again I am lucky to have a friend who owns her own salon: Kassandra Sommerville from the Ginger Suite Salon. And finally, there is me, amateur photographer who plays around with a Nikon D40 DSLR camera. 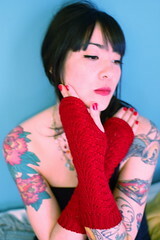 Recently, I designed a pair of long fingerless gloves which are basically a spin-off of the Adrienne Gloves. Now the photo shoot can begin! This image is going to be used for pattern publication, I am quite happy with it! The gloves looked so gorgeous on Lana... and Lana is such a sweet lady. 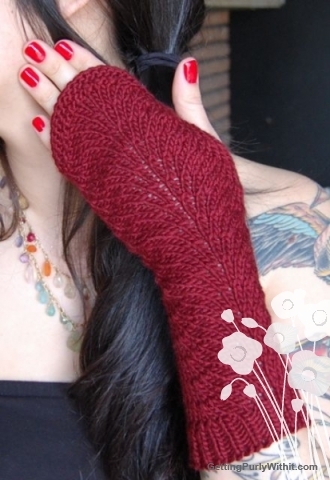 So I decided that the name of this pattern will be: Lana Gloves! Photography does not come naturally to me! Photography absolutely does not come naturally to me. I always feel awkward when I work with a model, partly because I am so very close into some body's space. Also, I have difficulties in understanding what my DSLR is capable of. It is only since a week now that I grasp the basics of photography and I am determined to get better at it. When I was a newbie knitter, I wanted to learn everything there is to learn about knitting. And nowadays, I am completely fixed on photography. I want to take you with me as I learn more and more! And I want to share all of my photography adventures with you as I gain more knowledge. When will the Lana Gloves be published, Nancy? The Lana Gloves, will be published very very soon. I need to write out the pattern and contact my graphic designers. And best part of all, the Lana Gloves are going to be issued for free. YAY! Thank you for your enthusiasm about the new site! Lastly, I want to thank you for your enthusiasm about the new site. I am so very happy you like it! Thank you for your trust and readership! Submitted by Anonymous on Mon, 06/14/2010 - 11:44.
oh wow, thanks so much, K!!! Submitted by Nancy Ricci on Mon, 06/14/2010 - 16:56. Submitted by Anonymous on Fri, 06/04/2010 - 22:22. These look similar to the Adrienne scallop gloves, but at a close look I can see the cool details! I can't wait to try out the pattern... I am slowly wading my way into lace, still a bit intimidated. Site looks amazing!! Submitted by Nancy Ricci on Fri, 06/04/2010 - 23:37. Yup, it does look similar to the Adrienne gloves! Just a simple change, and it get a whole different feel to it. Personally, I like these better than the Adriennes :) Thanks for liking my site! Submitted by JelliDonut on Fri, 06/04/2010 - 02:24. Here's a tip I got from a professional photographer--when doing portraits, use a zoom lens so you can step back and not feel like you are invading their space. Also, always be sure the eyes are in focus. And here's a little something from Flickr: http://www.flickr.com/groups/catchlight/. Submitted by Nancy Ricci on Fri, 06/04/2010 - 02:32. Susan, thanks for the tip! I do have a zoom (18-55mm) lens, but I also shoot with prime lenses: 35 mm and 50 mm. Prime lenses are a beautiful thing in itself and some say they shoot a tad sharper than zoom lenses. I just need to be more comfortable being close to subject. After all they themselves agreed to be photographed so they are fine with it.